Hello Beauties, I hope you all had a wonderful weekend! This weekend I managed to get all of my Christmas shopping done (as well as picking up a few bits for myself! ), now I just need to get through the endless task of wrapping them all ready for the big day! Along with Christmas shopping, I decided to spend this weekend having a bit of a pamper night after a week of feeling rubbish. Soap & Glory are one of my favourite 'pampering' brands, as they're not too expensive, so I headed to Boots ahead of my evening of relaxation. 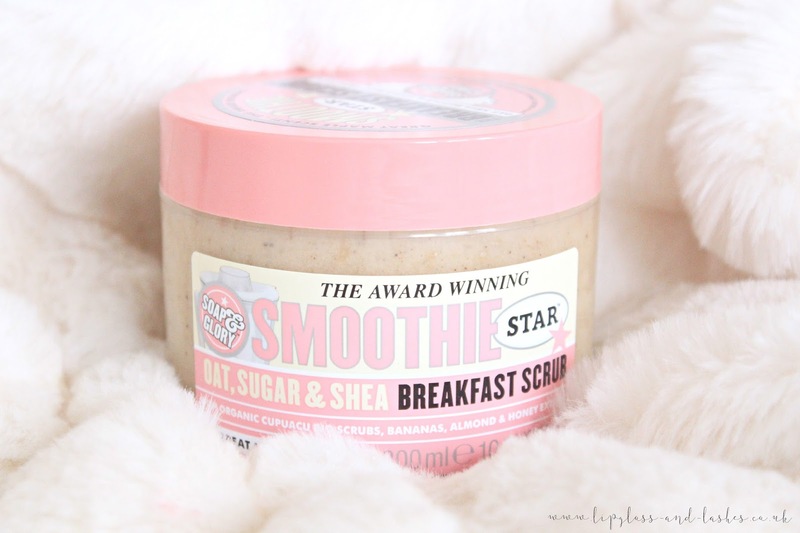 Soap & Glory are also my go-to for body scrubs, as they have such a great range of products, so I couldn't resist picking up a tub of The Breakfast Scrub. The Breakfast scrub comes in a clear and pink plastic tub with a screw on lid, making it easy to grab as much product as you need, and also make use of the whole tub (as I always end up looking product when it gets stuck in tubes). I really love Soap & Glory's packaging as it has a girly retro vibe to it and it just looks nice sitting on the side of my bath, next to the rest of my S&G stock! This body scrub contains oats, shea butter, organic cupuacu, banana, almond extracts and lastly, honey, which all work hand in hand to clean, polish, smooth and moisturise your skin. All of these ingredients also create the most wonderful scent. In short, this scrub smells exactly like pancakes with maple syrup. It's so good that I often find myself over-exfoliting just so I get to smell the scrub for a little longer. Another thing I love about the scrub is it's consistency. It's a fairly thick and gritty scrub as the small brown sugar granules and almond/oat pieces work in harmony to give your body a thorough exfoliation, whilst still being gentle on your skin. 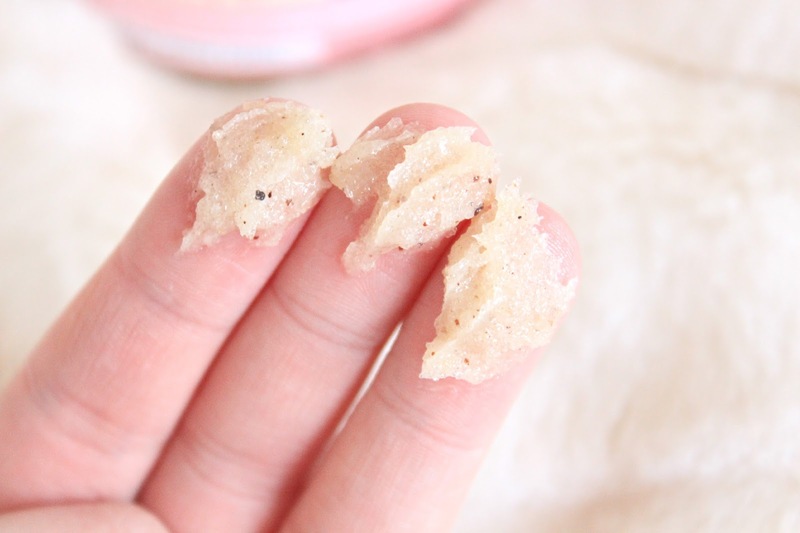 I like my body scrubs to be fairly abrasive, as it makes me feel like they're going over and above what a regular body wash would give me, results-wise, so this scrub is perfect for me. That being said, I really dislike scrubs which leave my skin feeling tight and dry, so I was pleasantly surprised to find that this scrub is actually fairly moisturising and always leaves my skin feeling really soft. Overall, I'm completely in love with this body scrub and it's definitely one I'd repurchase again and again - even just for the scent alone! If you like sweet, cosy smells and a good pamper then I'd definitely recommend giving this a go at only £8 from Boots (here). i got this in one of the S&G gift sets and I love it so much! Will have to purchase the full sized tub once it runs out! This sounds amazing, I love the S&G body products, especially the scrubs! Well done you on getting your christmas shopping done as well! This is one of my favourite products everrrrrrr! I like all of their scrubs and because I work in a nursery and chase around after babies/toddlers usually on my knees they are the driest, most chapped, uglyest knees you will ever meet but I use this once every other day and it sorts them right out!! I've heard so many people talking about Soap & Glory scrubs for the longest time! It feels like it took ages for us in the US to actually get it here. I'm really looking forward to getting my hands on one of the scrubs soon! This looks so yummy and nice! I have heard a lot about this product! Reading your review, I feel like I can pick up on the scent of the scrub already.